You can use a Gradient mask anytime you wish to edit sections of your photos in straight lines. This is especially useful in landscape photography with flat horizons. 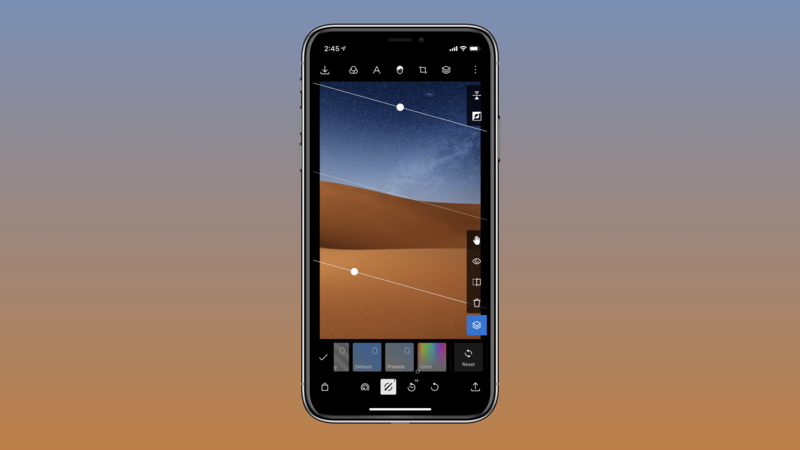 The Gradient mask makes it easy to make edits to the sky of those photos. But like with most tools, the Gradient mask is only limited by your creativity. Here's a quick overview of the Gradient mask in Polarr. You can find the Gradient mask under the Local Adjustments panel. This is the section where you can find all of our other masks like the Color mask, Brush mask or Radial mask. Go ahead and select the Gradient mask. A Gradient mask gradually applies your edits in an area across a straight line. To change the Gradient mask you can pinch to resize or drag to move and rotate. To resize on the desktop, just grab the white dots on one of the two lines. Once you've made a Gradient mask, you can select the invert button to switch the gradient direction. You can also select the reflect button to make the gradient run in both directions.